Despite mounting evidence that urban greenspace protects against mortality in adults, few studies have explored the relationship between greenspace and death among infants. Here, we describe results from an analysis of associations between greenness and infant mortality in Philadelphia, PA. We used images of the normalized difference vegetation index (NDVI), derived from processed satellite data, to estimate greenness density in each census tract. We linked these data with census tract level counts of total infant mortality cases (n = 963) and births (n = 113,610) in years 2010–2014, and used Bayesian spatial areal unit, conditional autoregressive models to estimate associations between greenness and infant mortality. The models included a set of random effects to account for spatial autocorrelation between neighboring census tracts. Infant mortality counts were modeled using a Poisson distribution, and the logarithm of total births in each census tract was specified as the offset term. The following variables were included as potential confounders and effect modifiers: percentage non-Hispanic black, percentage living below the poverty line, an indicator of housing quality, and population density. In adjusted models, the rate of infant mortality was 27% higher in less green compared to more green tracts (95% CI 1.02–1.59). These results contribute further evidence that greenspace may be a health promoting environmental asset. 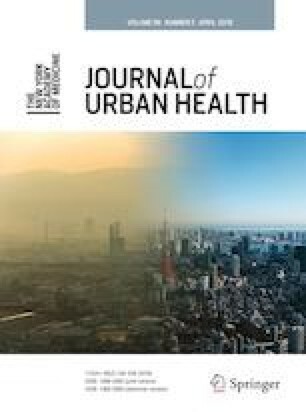 The authors would like to thank the Drexel University Urban Health Collaborative, who helped to prepare some of the data that they used in these analyses. This work was supported, in part, by a grant from the Commonwealth University Research Enhancement (C.U.R.E.) program, funded by the Pennsylvania Department of Health, 2015 Formula award SAP # 4100072543. United Nations. 2014 Revision of the World Urbanization Prospects 2014. https://esa.un.org/unpd/wup/publications/files/wup2014-report.pdf. Accessed 29 March 2019. Nowak DJ, Bodine AR, Hoehn RE, et al. The urban forest of Philadelphia. Newtown Square, PA2016. https://www.itreetools.org/resources/reports/PhiladelphiaUrbanForest.pdf. Accessed 29 March 2019. Freeh R, Wu S. Mayor’s Office of Sustainability. Greenworks Philadelphia 2015 Progress Report. https://www.phila.gov/media/20160419140539/2015-greenworks-progress-report.pdf. Accessed 29 March 2019. Ouyang M, Siegel C, Washington R. Vital statistics report. Philadelphia: 2014. 2017. https://www.phila.gov/media/20181105161044/2014-Vital-Statistics-Report-FINAL.pdf. Accessed 29 March 2019. Weier J, Herring D. Measuring vegetation (NDVI & EVI). 2011; http://earthobservatory.nasa.gov/Features/MeasuringVegetation/. Accessed January 20, 2016. Hijmans RJ, van Etten J. Raster: geographic analysis and modeling with raster data. R package version 2.0–12. http://cran.r-project.org/package=raster. 2012. Accessed 15 March 2018. City of Philadelphia. Philadelphia Vital Statistics Reports; http://www.phila.gov/health/commissioner/VitalStatistics.html. Accessed April 10, 2018, 2018. R: A language and environment for statistical computing. R Foundation for Statistical Computing, Vienna, Austria. https://www.r-project.org/. Accessed 15 March 2018. United States Census Bureau. American Community Survey. https://www.census.gov/programs-surveys/acs/. Accessed October 5, 2018, 2018. United States Census Bureau. The history of the official poverty measure. 2017; https://www.census.gov/topics/income-poverty/poverty/about/history-of-the-poverty-measure.html. Accessed October 5, 2018, 2018. City of Philadelphia Office of Property Assessment. OpenDataPhilly: Property Assessments. 2018; https://www.opendataphilly.org/dataset/opa-property-assessments. Accessed April 10, 2018, 2018. Bartram's Garden. 2018; https://bartramsgarden.org/about/mission-vision/, Accessed October 5, 2018. Wissahickon Valley Park Train: Pennsylvania. 2018; https://www.traillink.com/trail/wissahickon-valley-park-trail/. Accessed October 5, 2018.